Irish Aid is the Government of Ireland's programme of assistance to developing countries operating under Embassy of Ireland in Tanzania. In support of the Government of Tanzania's goal of inclusive economic growth and poverty reduction, Irish Aid's country strategy focuses on Health, Nutrition and Agriculture with a strong governance component supporting the achievement of results across the programme. Ireland believes that agriculture is key to the transformation of the Tanzanian economy and is committed to working with a range of stakeholders, including the Government, private sector and farmer organisations to develop innovative solutions aimed at increasing agricultural efficiency and productivity and ultimately improved livelihoods for male and female small holders and pastoralists. 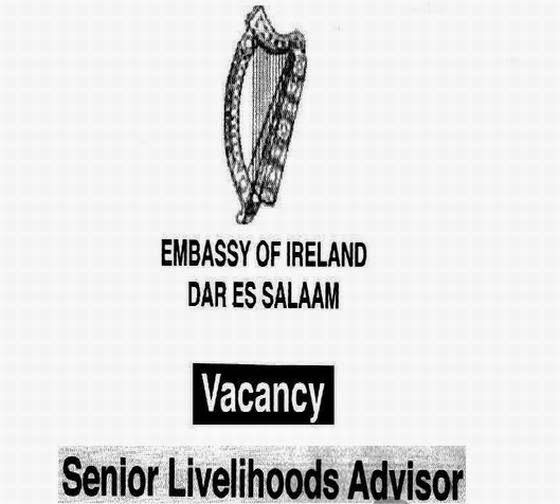 The Embassy is now seeking to recruit a highly motivated and experienced Senior Livelihoods Advisor who will contribute to the delivery of improved livelihoods for poor men and women and youth. Working as a senior member of the Livelihoods Team, the post-holder will be responsible for the Embassy's support and engagement in public policy in agriculture, for the management' of partners and for the provision of technical advice and analysis. The successful candidate is expected to have a Masters qualification in a relevant discipline and a minimum of eight years relevant working experience including at senior management level. A sound understanding of the relevant Tanzanian policy and institutional environment along with critical analytical and policy influencing skills are key requirements. Interested candidates should forward a cover letter together with their most recent Curriculum Vitae and contact details, to stephen.simbila@dfa.ie by cob Monday June 8th 2015.